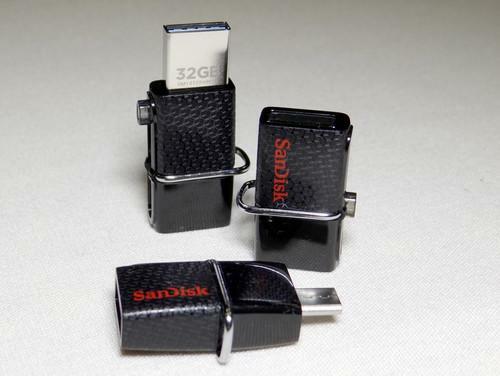 SanDisk has launched a new version of its small USB stick that can help transfer pictures, video and other files between computers and smartphones. The Ultra Dual USB Drive 3.0 comes in 16 gigabyte (GB), 32GB or 64GB capacities and has a conventional USB connector on one end for hooking up to a computer and a micro USB connector on the other end for plugging into a smartphone. Compared to a version launched in 2014, the new model supports the USB 3.0 standard that offers faster data transfer speed. It's compatible with PCs and Macs but the smartphone needs to be an Android phone that supports "USB On The Go," a recent addition to the USB specification that allows phones to recognize USB memory devices. Most high-end phones include On The Go support, but many mid-range and low-end handsets don't so check the specifications of your phone. The USB connectors stay hidden when not in use and slide out of the device when needed. SanDisk has designed the micro USB connector to be 2 millimeters longer than normal so phones don't have to be removed from protective cases when being used with the gadget. The drive costs between $23 and $65 depending on capacity and is available now, the company said.